Fantagraphics' Complete Peanuts series entered its historical sweet spot about two volumes ago, a run that should last two or three volumes from now. 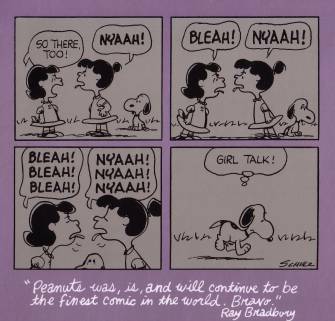 That's not to say the conventional wisdom surrounding Peanuts' heyday is true, or that the earlier volumes haven't been voyages of discovery in the way I imagine the last few volumes will be as well. But these are indeed the glory years, when the strip was still working through what seemed like an infinite number of rich storylines and well-grounded gags starring the main characters while at the same continuing to introduce memorable minor ones (we get Jose Peterson in this one). 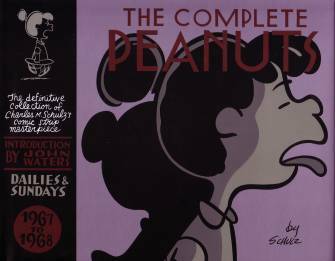 In this volume we get a number of memorable Snoopy sequences, including an arm-wrestling with Lucy gag that I adored as a kid (and love now for the energetic art), his great vulture impersonation, and the return of original owner Lila. 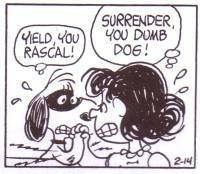 These were strong years for Peppermint Patty and especially Lucy, maybe the most underrated comic strip character ever. In fact, Lucy is the subject of John Waters' introduction, which if you think about it makes perfect sense. It's hard to keep up with a series of hardcovers like this, even if you're careful to look for bargains which can reduce the price to around $20. I've read most of these comics before (though not all: I'd forgotten the best Peppermint Patty sequence in the book, with her taking responsibility for some younger girls at summer camp; I also didn't remember Franklin's dad was in Vietnam! ), but reading them all at once in this beautiful package is like driving a wonderfully built custom car or a eating your favorite meal in a restaurant up to the challenge. You no longer have the shock of the new, the novelty that comes with discovery, but the strip no longer wobbles. It could, by this point, carry an entire world on its back.